We have talked about Mozilla's move to improve Firefox memory usage starting with Firefox 7. Up until yesterday those improvements were only available in Firefox Nightly builds. Mozilla rolled out Firefox 7 to the Aurora channel today, and boy has memory usage gone down. The memory usage of the browser was usually in the 300 to 400 Megabyte range on my computer, with a reasonable amount of tabs open and extensions installed. Reasonable in this regard means ten or less. After updating Firefox to version 7, that memory usage went down to around 200 Megabytes, with the same amount of extensions installed and tabs open. That's a significant improvement for a browser that is perceived as a memory hog by many. 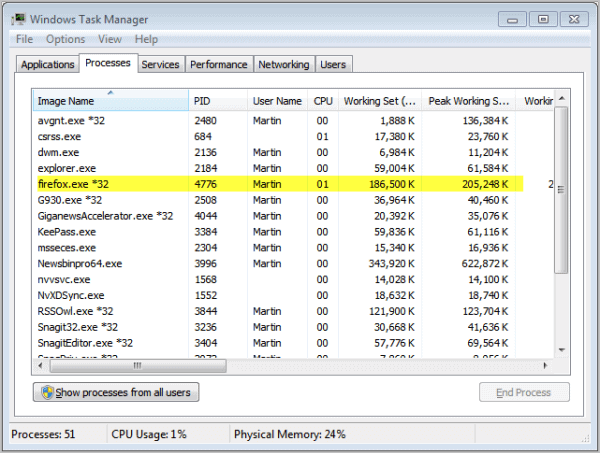 Firefox users with a reasonable amount of RAM installed on their computer might not notice a difference in performance, but users with limited amount of computer memory surely will. Another observation here is that the garbage collection and releasing of memory has been optimized as well, so that Firefox users will notice a drop in RAM use every now and then. Firefox stable users, who are currently running Firefox 5, will have to wait another three months or so before they can update their version of Firefox to version 7. Beta users, currently running beta 5 will get access to the new version in about six week's time. Conceivable Tech report that Firefox 7 ships with additional improvements and features, among them an optimized synchronization feature, better font rendering, and a new Azure 2D graphics API that improves the browser's 2D graphics performance significantly. Firefox 7 scores better in the HTML5test, with a score of 312+9 out of 450. That's less than 20 points from Google Chrome 14 which scores 329+13. Firefox 6, the next beta and stable version of the browser, in contrast will be a rather uneventful update. Computer users interested in the latest Aurora build of the browser can download it from the official Mozilla website. Existing Firefox Aurora users can update the browser with a click on Help > About Aurora. If you are already running or testing the latest Firefox 7, what's your impression so far? I’ve used the aurora channel since aurora 5 and it barely ever crashes on me. don’t really get why they’re saying it’s ‘not for the faint of heart’ lol. FF7 does not have PGO compiler, Mozilla team removed it because of crashes it causes even then it is very much fast now. PGO will be back in FF8 once Mozilla Team moved the code to MSVC 2010.
i dont really notice much difference between ff5 and aurora7. memory usage is as good/bad as always with 200-250mb with only a few tabs open and startup time is about as fast as ff5, too. dont know what the fuzz is about. The Mozilla team – in their infinite wisdom – introduced the Panorama feature in Firefox 4 (to mimic Chrome, or Opera) while Firefox was the worst example of browser memory management. Now they tell us that this problem will be fixed in version 7. 300 or 400 Mbytes is a joke, FF4 or FF5 uses almost 700 Mbytes on my notebook. This is further amplified by using the Panorama feature as people will get used to ‘hide’ tabs, and not close them. 42 tab, in 7 groups means 1,6 Gbytes of memory in Firefox. The same in Opera is about 400 Mbytes.